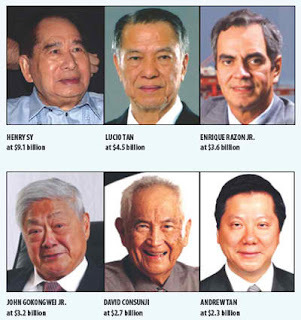 Forbes Magazine has just released its 2012 list of the 40 Richest People in the Philippines. SM tycoon Henry Sy retained his spot as the country’s richest person with an impressive net worth of $9.1 billion. There are also newcomers: Lucio and Susan Co of Puregold and civil engineer Michael Cosiquien of Megawide Construction. Two from 2011 missed this year’s $140 million cut off: Luis Virata of Nickel Asia and media tycoon Eugenio Lopez Jr.